San Franciscans are extremely multi-modal—strongly supporting San Francisco’s Transit-First Policy (1973) but also car-dependent when warranted or even necessary. But SFMTA hasn’t listened to Muni riders or automobile drivers—-making life maddening and costly for everyone. Prop L shouldn’t be portrayed for what it is not. Reading the language of Prop L should be the starting point for a needed dialogue—with 79% of San Franciscans who drive occasionally. Cutting Muni service in every neighborhood, SFMTA has forced people into automobiles—then penalized drivers with increased fees, fines, citations, meters, parking elimination…. Prop L is more about fairness for all San Franciscans rather than a fight over cars, bicycles, pedestrians and public transit. Any “divide and conquer” tactic serves only the San Francisco Municipal Transportation Agency’s propensity for ever-higher budgets, wasteful spending, bad projects and service cuts. Prop L is a Declaration of Policy. The ballot language essentially advocates for equal representation and equal “taxation” for 79% of San Franciscans who use cars—at least occasionally. San Francisco’s modal trip shares are 24 percent by walking, 20 percent by transit, 3 percent by bicycle, and 53 percent by automobile. Mayor Ed Lee is neutral on Prop L. At the SF Chronicle’s Editorial Board, the Mayor said” “I’m not worried about it [Prop L].” With more Muni service cuts in neighborhoods proposed in Prop A, there’s good reason to vote No on Prop A and Yes on Prop L.
Prop L’s underlying message is inclusion—an underlying democratic principle for all public policy. Voting YES ON PROP L doesn’t preclude Transit-First. Voting YES ON PROP L is a return to fundamentals of planning an integrated citywide transportation system. Instead of making everyone unhappy, SFMTA can listen and spend money wisely to achieve a holistic transit system—rather than driving people into cars. Before we throw away billions of more dollars, let’s get our act together! We need an urgent acceleration of the TransbayTerminalCenter and Downtown Rail Extension—as the top priority for state/ regional/ local transportation dollars and Federal New Starts applications. San Franciscans have already set this priority through 1999’s Prop H, 2003’s Prop K and 2010’s Prop G. Otherwise, dense development and tens of thousands of new residents/ workers would overload San Francisco’s street system and Municipal Railway—an inequitable give-away of public assets. By 2015, 281,000 cars a day will be entering San Francisco from the South (525,000 cars a day by 2035)—more than the combined number of cars on the Golden Gate and BayBridges. The TransbayTransitCenter is the best investment to fulfill a regional need. By comparison, the Central Subway’s dismal new rider projections demonstrate San Francisco’s politicized shoot-yourself-in-the-foot (more like both feet) transit policies. Before any more transit insanity (like a northern Central Subway extension), decision-makers should study Zurich’s 60% transit modal share—by transit-priority streets and an integrated system. “Unlike European trams, which often cover long stretches in independent lanes, American streetcars tend to span walkable distances and share the road with other vehicles. This means they inch along with traffic, often at less than 12 miles per hour, on tracks that make it impossible to navigate busy streets or ride around obstacles. Indeed, their slow speeds and frequent stops mean they often cause more congestion. A bus route could move up to five times more people an hour, says Randal O’Toole of the Cato Institute, a think-tank. If streetcars are so slow and costly, why are there suddenly so many? Because federal subsidies have encouraged them. Under Barack Obama the Department of Transportation has made grants of up to $75m available to “small” projects that promise to revitalise urban areas and cut greenhouse-gas emissions. They need not be cost-effective in the conventional sense if they make a place more liveable or offer other vague benefits. Item 9 TransbayTransitCenter (at about 1:30 hours into video). Informative presentation and public testimony on the Community Benefits District. Interesting articles on the history and intrigue regarding the Transbay Terminal. Not totally time for congratulations yet—as the final vote on the Transbay Community Benefits District is delayed for two weeks. Need to watch how terms of the district are “tweeked”. TRANSBAY TERMINAL ARCHITECTURAL COMPETITION: Knowing what we know now—“SkyPark” on hold, no high-speed escalators, no curving glass facade etc.—would the SOM design have won the original competition? Where’s the accountability? HAPPY LABOR DAY! No Bonds Without Accountability: Vote No on A. Start your own grassroots campaign: Forward this to friends and colleagues. Raising property taxes and rents, without legal language to commit funds only to Muni, is deceptive—especially when Prop A’s TEP (Transit Effectiveness Project) eliminates more Muni service in neighborhoods. 1) Raises property taxes and rents, by a 50% pass-through with no exemption for rent-control units, to pay for General Obligation Bonds of $500 million, with $500 million in interest, for a total debt of $1 billion—without accountability. 2) Non-binding legal language in the Ordinance. a) “May be allocated” spending language, unlike other state and local bond measures. b) “May include but not limited to” legal language, unlike any contract or agreement. P. 3–5: The Ordinance’s legal language makes no commitment to any specific work: “Projects to be funded under the proposed Bond may include but are not limited to the following:”For eight project types: “A portion of the Bond may be allocated to…” Everywhere else in the Ordinance, “shall” is used. 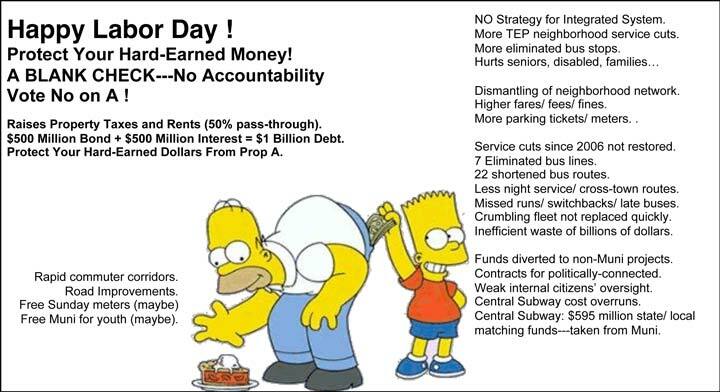 4) Prop A does not restore past Muni service cuts. Since 2006, Muni has eliminated bus routes, shortened bus lines, decreased frequency, decreased night service, worsened switchbacks/ missed runs/ late buses and decreased connectivity in every neighborhood. 6) Oversight provisions are extremely weak, with a citizens’ committee merely empowered to conduct an annual after-the-fact review of spending and to report ﬁndings to the Mayor and Board. The committee has no say in the allocation of the funds. 7) Prop A is silent as to who decides on projects that will be funded and on dollar amounts. 8) Muni has already wasted billion of dollars. Muni service levels and ridership numbers have declined—while Muni budgets, staffing and salaries have soared. The only independent audit of Muni projects, by CGR Consultants in 2011, concluded that nearly all of Muni’s large capital projects have large cost overruns. 9) Prop A’s dollars can be taken by other projects’ cost overruns. Before voters give SFMTA more money, SFMTA must show that it can track its capital projects’ schedules and budgets, as well as avoid overruns. 10) A Better Way! Reject this bond measure! From the surging City Budget ($8.6 billion this year), allocate General Fund dollars to Muni’s operating and maintenance budgets. Instead of new bond debt, utilize the $500 million savings in debt interest, to implement 2003 Prop K’s transit-preferential streets—quicker and cheaper. Before unproductive debt, let’s reverse Prop A’s policy of Muni cuts in neighborhoods. Then, SFMTA should work from a carefully-developed plan geared to solving San Francisco’s most critical transportation needs—prior to new bonds. SFMTA should not be doling out $500 million haphazardly in response to pressure from politically-connected groups.